The thugs attacking Egyptian pro-democracy protesters and attacking reporters are clearly not mostly spontaneous “pro-Mubarak protesters”, but mostly people paid to demonstrate for him, hired thugs and plain clothes police like those Mubarak used to attack opposition campaigners during the 2005 Presidential election and referendum – which were rigged (1) – (9). (There may also be some pro-Mubarak demonstrators who simply support him because they have watched Egyptian state TV as their only source of information, or because they work for the government or rely for their jobs in it on the patronage of regime members or relatives in it). 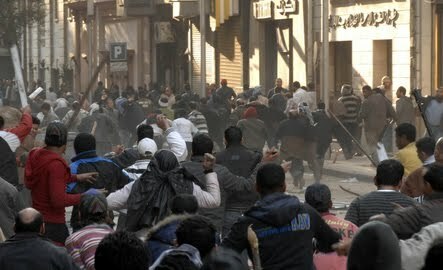 The army were ordered to allow them into Tahrir Square and given no order to stop Mubarak’s brigades attacking (10). Mubarak hopes this tactic will let him avoid responsibility for the people they injure and kill. He can’t. While the Obama administration continues to provide his government with financial aid they are responsible too. They should cut all aid until he is gone and an all party transitional government is in place. State Department official P J Crowley said that “We reiterate our call for all sides in Egypt to show restraint and avoid violence.”, as if the attackers (many armed with guns, knives, iron bars and machetes) and those attacked or defending themselves were equally responsible for it. British Prime Minister David Cameron’s statement that “if” the violence was orchestrated by the Mubarak government then it would be “utterly unacceptable” pretended that there was any question about whether Mubarak organised it, even after his use of similar tactics over decades (11) – (12). These and Obama’s vague statements differ markedly from their straightforward condemnation of the Iranian government when it similarly used Basij plain clothes militia to beat, terrify and kill pro-democracy protesters. (7) = Guardian 26 May 2005 ‘Dissent quashed as Egypt votes on reform’,http://www.guardian.co.uk/world/2005/may/26/brianwhitaker ; ‘Security forces and violent gangs cracked down on dissenters yesterday as Egyptians voted in a constitutional referendum that opposition parties have denounced as a sham….smaller groups of protesters who ventured on to the streets were set upon by security forces or pro-Mubarak gangs. In one incident, police withdrew to let a gang beat up more than a dozen supporters of the Kifaya ("Enough") movement, which is calling for an end to the president's 24-year rule. (8) = Guardian 27 May 2005 ‘Egypt claims 83% yes vote for change’,http://www.guardian.co.uk/world/2005/may/27/brianwhitaker ; In some cities, plainclothes government agents beat protesters and dozens of arrests were made. (10) = guardian.co.uk 02 Feb 2011 ‘Mubarak supporters stage brutal bid to crush Cairo uprising’,http://www.guardian.co.uk/world/2011/feb/02/hosni-mubarak-supporters-violence-cairo ; ‘Yesterday, army and activists staffed checkpoints to prevent violence; today, Egyptian soldiers made no effort to prevent confrontation…..At one stage, they moved out of the way to allow pro-Mubarak demonstrators to reach their opponents….Among those attacking the square were groups of armed men who appeared to be plainclothes police officers. 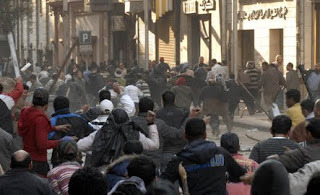 Credible reports spoke of some of those involved in the assault in Tahrir Square having been paid by the regime….On one boulevard leading from the square, a group of men had been deployed with weapons in their hands, clearly under orders.